Stock photo of ice formations on the walls of Johnston Canyon at the Upper Falls during winter, Banff National Park, Canadian Rocky Mountains, Alberta, Canada. 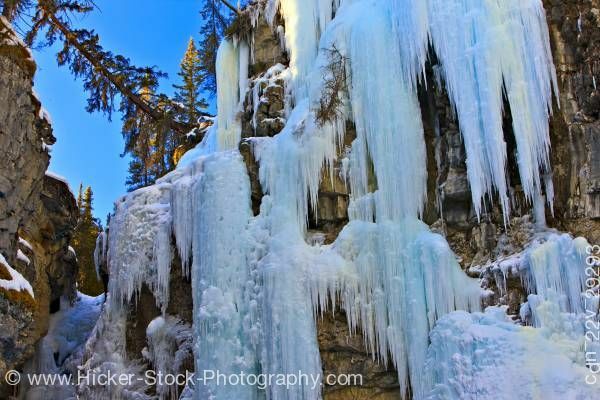 This stock photo Winter scene shows gorgeous ice formations on the walls of Johnston Canyon at the Upper Falls during winter, Banff National Park, Canadian Rocky Mountains, Alberta, Canada. Banff National Park forms part of the Canadian Rocky Mountain Parks UNESCO World Heritage Site. Certainly an area that shows the power of nature and time - rushing water carves a path through the limestone canyon and potholes form over the years from plunging waterfalls. This is one of the most popular hikes in Banff National Park. Catwalks and view platforms permit a unique variety of vantage points for enjoying this remarkable canyon and its waterfalls.